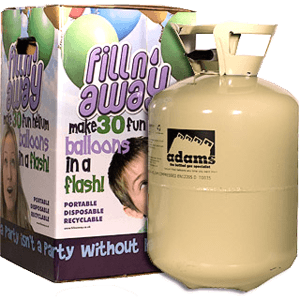 This package includes two of our smallest and cheapest helium cylinders, ideal for celebrations and events at home where you only need to inflate a very small number of balloons. Only weighing around 4kg each, these convenient, light and simple to use canisters are perfect if you need to take it to a venue or transport by car. The Disposable Cylinder 60 package will inflate up to 60 9" latex balloons, 46 10" balloons or around 30 18" foil balloons, and can be stored if you need to use it for one or more occasions. Your cylinders are delivered by courier and once you've used all the helium, you can take it to your local household recycling centre. Click here to compare all our disposable cylinders.